Sweet + Sour uniquely combines the sensibilities of the old-fashioned sweet shop of your childhood with contemporary creativity and innovation for every kind of lover of sweets! Mom-turned-Baker, Mrs. B, puts the very same love and care for her family into the specialty sweets of Sweet + Sour. From custom made cakes, pies, tarts, brownies to the most beloved Cupcakes by Sweet + Sour, Mrs. B uses nothing less than the finest of ingredients from around the world to provide the highest quality baked goods to satisfy the deepest and sweetest of desires. Her Southern American roots inspire the classic and highly favored Red Velvet Cupcakes. Where as her creative vision elevates the familiar, creating unique flavor and designs such as the rich chocolate cake topped with graham cracker crisps and fluffy toasted marshmallow frosting of the S’Mores Cupcake. Since the Fall of 2010, Mrs. B has been spreading her baked goodness from Sweet + Sour in District 2. The Bakery welcomes visitors to an open kitchen where they can watch and be a part of what makes our sweets so special as we mix homemade vanilla essence and pipe away at freshly baked trays of cupcakes. 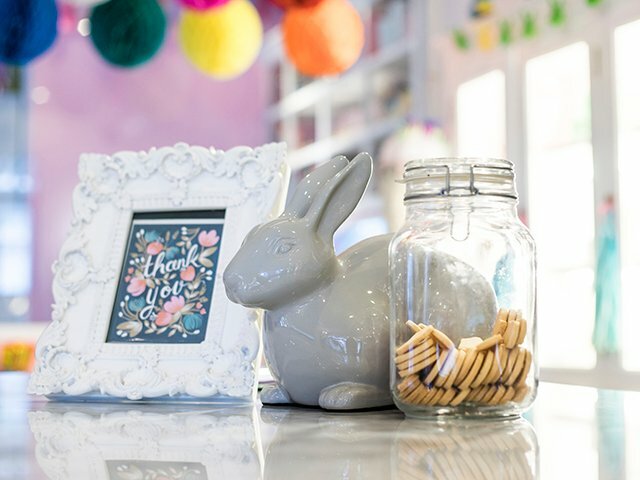 Glass jars full of classic candy treats line the counter and drawers filled with novelty trinkets and gifts surprise curious explorers. Come visit Sweet + Sour and enjoy our sweets with your family and friends in our outdoor courtyard!